A team led by Carroll has spent years investigating mouse models of lupus to better understand the ins and outs of autoimmune diseases. Their latest findings, published in Cell, reveal that rogue B cells — immune cells that produce antibodies and program the immune system to attack certain antigens — can trigger an "override" that launches the body into an autoimmune attack. Adding insult to injury, B cells' immune targeting instructions can rapidly expand to order an attack on many more tissue types within the body. Carroll, who is senior author on the new study, and his team think their findings can finally shed some new light on a biological phenomenon known as epitope spreading, which is when the immune system begins to go after antigens on other parts of the body that it wasn't originally instructed to destroy. Epitope spreading is a hallmark aspect of autoimmune disease, as it leads to widespread immune attack against the body's own tissues, and understanding what triggers it could open the door to new therapies designed to halt the autoimmune response in its tracks. "It has been a long-standing observation in the clinic that autoimmune diseases evolve over time, attacking an ever-expanding array of organs and tissues – a phenomenon known as 'epitope spreading,'" says Søren Degn, PhD, first author on the new study. "This presents in the patient as a broadening of clinical symptoms, which can include joint pain, kidney damage and severe skin rashes. But, until now, we've largely been in the dark about how this process occurs." 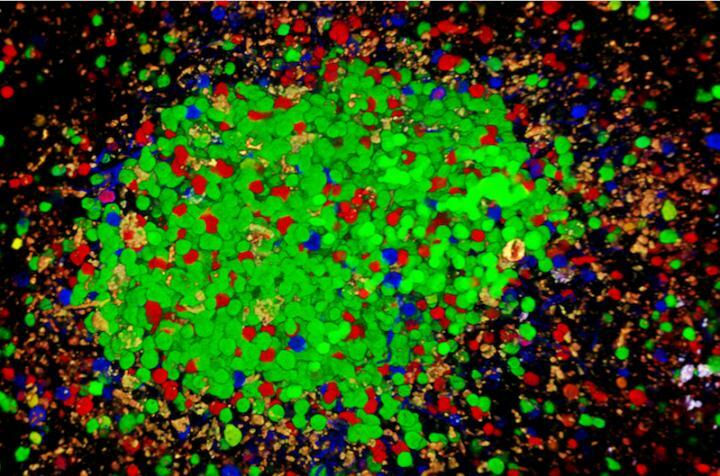 To understand what leads to epitope spreading, Carroll's team used what is called a "confetti" technique — aptly named for its colorful appearance in imaging — in a mouse model of the autoimmune disease commonly called lupus. "Lupus is known as 'the great imitator' because the disease can have so many different clinical presentations resembling other common conditions," says Degn, who is a research fellow at Boston Children's and an assistant professor of biomedicine at Aarhus University. "It's a multi-organ disease with a plethora of potential antigenic targets, tissues affected and 'immune players' involved. Lupus is considered a prototypic autoimmune disease, which is why it's so interesting to study." Studying mice, the team used fluorescent "marker" proteins to distinguish between different B cells, which, just like in humans, are the cells that help set an immune response in motion. When the body senses an antigen (a protein that is — or in the case of autoimmune disease, appears to be — foreign), B cells aggregate in cellular clusters called germinal centers. "That's why at the onset of a cold or sore throat, lymph nodes become swollen — they are filling with germinal centers to ready an immune counterattack," says Cees van der Poel, PhD, a co-author on the study and a postdoctoral fellow in Carroll's lab. "The spleen is another site that germinal centers form in." In these germinal centers, B cells make competing antibodies in response to the detected antigen, battling each other to create the best antibody for the job of neutralizing the invading threat. Eventually, the best B cell clone with the most effective antibody wins out, and, in concert with other immune cells, activates an attack. However, this highly-effective process can wreak havoc if the body incorrectly senses an "autoantigen" on one of its own tissue types. By using fluorescent colors to differentiate between B cell clones, Carroll's team watched the same germinal center activity happen during an autoimmune response. The B cell "colors" battled to create an autoantibody in a model of lupus. "It's truly natural selection on a microcosm," says van der Poel. "Once activated, there are ten different possible colors to represent different B cell clones. Over a week or two, the color diversity begins to shift — eventually one color dominates, representing a single clone winning out." Once the autoimmune response is triggered, Carroll says the "runaway train pulls out of the station, so to speak," and the immune system begins to go after other, similar autoantigens elsewhere in the body. "Over time, the B cells that initially produce the 'winning' autoantibodies begin to recruit other B cells to produce additional damaging autoantibodies — just as ripples spread out when a single pebble is dropped into water," says Degn. "This finding was such a surprise," says Carroll, who is a senior investigator in the Boston Children's Program in Cellular and Molecular Medicine and professor of Pediatrics at HMS. "It not only tells us that autoreactive B cells are competing inside germinal centers to design an autoantibody, but then we also see that the immune response broadens to attack other tissues in the body, leading to epitope spreading at the speed of wildfire." For now, the team says, understanding how B cell activity in germinal centers relates to epitope spreading is a big leap in the right direction. They speculate that a therapy that "blocks" germinal centers — which act as the immune system's working memory — might one day be used to halt the vicious cycle of autoimmune diseases. "Blocking germinal centers in the midst of an autoimmune response could potentially block the epitope spreading process," says Carroll. "If you could stop the adaptive immune system for a transient amount of time, it might allow the body to reset its immune responses and shut off the autoreactivity." In addition to Carroll, Degn and van der Poel, the paper's additional co-authors are Daniel J. Firl, Burcu Ayoglu, Fahd A. Al Qureshah, Goran Bajic, Luka Mesin, Claude-Agnès Reynaud, Jean-Claude Weill, Paul J. Utz and Gabriel D. Victora.